The remainder of Sunday’s Monster Energy NASCAR Cup Series Food City 500 at Bristol Motor Speedway has been postponed to Monday because of rain. On-track action is scheduled to begin at 1 p.m. ET on Monday, with TV coverage on FOX (PRN and SiriusXM NASCAR Radio will have the radio coverage). Kyle Larson was scored as the leader after 204 laps when the race’s fourth red flag flew. There were three stoppages for rain (at Laps 49, 165 and 204) and one for crash clean-up (Lap 119). Intermittent rain also delayed the start by approximately a half-hour. The green flag was initially set for 2 p.m. ET on Sunday, but NASCAR officials decided Saturday to move the start time up to 1 p.m ET. Sunday morning rain adjusted the start time to 1:28 p.m. ET. Larson led 74 laps and had opened up a significant edge before the rains came for a final time. His Chip Ganassi Racing No. 42 Chevrolet was able to steer clear of rampant trouble in the race’s first half. Larson said he was optimistic about his chances whenever the race resumed. He started from the pole position and led a race best 202 laps in last year’s Spring race at Bristol but finished sixth. “Yeah, it’s hard to get a rhythm with all the rain and stuff and then getting out of your car and getting back in,” Larson said. “Our McDonald’s Chevy is really fast, I would just like to get some racing going, but then again, I feel like I always do better or do worse once the track gets a bunch of rubber on it. Some of those early pitfalls snagged early leader Ryan Blaney, who led 100 of the first 117 laps before his Team Penske No. 12 Ford was swept into a crash near the end of Stage 1. 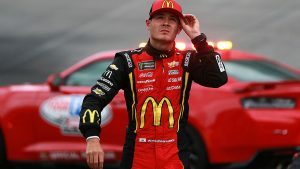 A collision involving the cars of Trevor Bayne and Chris Buescher obstructed the track, collecting Jamie McMurray, Harrison Rhodes and Blaney, who retired in 35th place with heavy front-end damage. A Lap 3 stack-up sidelined other Bristol hopefuls. Michael McDowell lost control through Turn 4, and his spinning No. 34 Ford entangled Chase Elliott’s No. 9, Martin Truex Jr.’s No. 78 and AJ Allmendinger’s No. 47. Brad Keselowski led once for 13 laps to win Stage 1, vaulting to the front when Blaney, his Team Penske teammate, crashed out. He was scored in 14th place when the race was forced to a Monday conclusion. After seeing warm and sunny skies on Friday and most of Saturday, Sunday’s forecast that called for thunderstorms and 100 percent chance of precipitation proved correct. Storm clouds moved in Sunday morning and it began raining shortly after 10 a.m. ET. Hendrick Motorsports driver Jimmie Johnson — currently scored eighth after starting at the back of the pack — is the defending race winner. Last spring’s Bristol race was also contested on a Monday.